Pelican (peli) Case 1400. Condition is Used. Dispatched with Royal Mail 2nd Class. Fantastic protective case. Custom foam inserts can easily be added from the Peli website. The 1400 is waterproof, dustproof and crushproof. The case has two latches and a comfortable rubber over-moulded handle making it convenient to carry. This used to be my compact top box on my motorbike. The case used to attach to a rack via few bolts through holes at the bottom of the case. The pictures show this in detail. Everything else on the box in is good condition. Unbreakable, watertight, airtight, dustproof, chemical resistant and corrosion proof. Its exclusive 6.4 mm neoprene o-ring and ABS latches seal perfectly and includes an automatic purge valve for quick equalization after changes in atmospheric pressure. 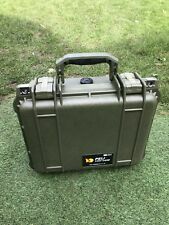 New Genuine Peli Case 1400 with foam insert lid. 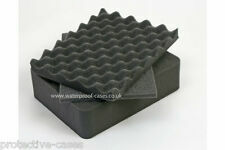 Supplied with internal foam lid support. • Unbreakable, watertight, dustproof, chemical resistant and corrosion proof. • O-Ring seal. • Easy-open, double-step latches. Protection : Corrosion-proof, Crushproof, Dustproof, Waterproof. The case has two latches and a comfortable rubber over-molded handle making it convenient to carry. The stainless steel padlock protectors allow you to easily secure the case. This Peli 1400 is unbreakable, watertight, airtight, rustproof, chemical resistant and corrosion proof. It is made of. Protective Cases are specialist suppliers in the whole range of Peli Cases and Peli Torches. This Peli 1400 is unbreakable, watertight, airtight, dustproof, chemical resistant and corrosion proof. It is made of. o-ring and ABS latches seal perfectly and includes an automatic purge valve for quick equalization after changes in atmospheric pressure. 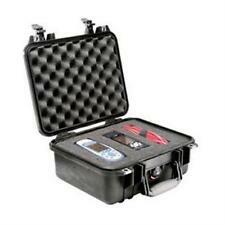 Silver Peli 1400 Water Proof Hard Case. 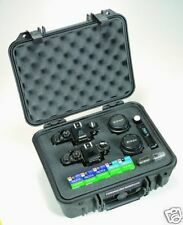 Pelicase 1400 - PELI 1400 Case Black with Foam . In great condition. Item will be sent out recored delivery. 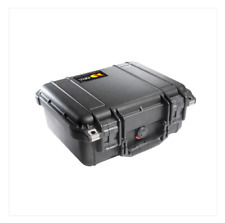 Peli 1400 case with foam, built in pressure equalization valve, large fold down handle. Made of ultra high impact copolymer with 3 piece foam set interior,strong, lightweight, watertight and dustproof. Easy open double throw latches and stainless steel reinforced padlock protectors. Personalized nameplate service available. Available in orange colour. Lifetime Guarantee of Excellence. With Foam Black. We will do our best to turn any less than satisfactory experience into a positive one. We Always Provide The BEST SERVICE! This Case is marked Peli Case But does not have the model number on it. The case has a few light scuff marks but otherwise in new condition. Peli Case 1400 Ersatzschaumstoff | Würfelschaum, Rasterschaum, Foam | *NEU*. Peli / Pelicase 1400 mit Schaumstoffeinsatz. Tropentauglich, wasserdicht und staubdicht, bruchfest, schwimmfähig. - Deckel Tiefe 3 cm. - Boden Tiefe 10.2 cm. - mit Schaumstoffeinsatz. Automatisches Druckausgleichsventil. Foto Zubehör. Dia & Film. In a used condition with abrasions and scratches. designt by | stevens-design. Peli Case 1400, 1450, 1500, 1510, 1520 Ersatzverschluss 36 mm, schwarz | *NEU*. 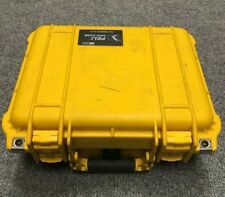 Peli Case 1400, 1450, 1500, 1510, 1520 Ersatzverschluss 36 mm, gelb | *NEU*. Peli Case 1400, 1450, 1500, 1510, 1520 Ersatzverschluss 36 mm, orange | *NEU*. Peli Case 1400, 1450, 1500, 1510, 1520 Ersatzverschluss 36 mm, silber | *NEU*. Peli Case 1400, 1450, 1500, 1510, 1520 Ersatzverschluss 36 mm, oliv | *NEU*.